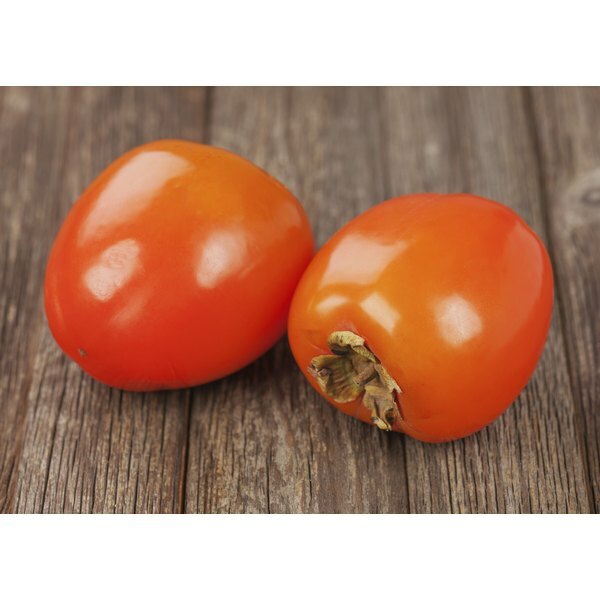 The Sharon fruit, more commonly known as a Fuyu persimmon or Japanese persimmon, is a sweet, tomato-shaped orange fruit you can find in grocery stores from late September through May. The Fuyu persimmon has a delicately sweet and cinnamon-laced flavor, and develops a custard-like texture when fully ripe. Fuyu persimmons, or Sharon fruit, can be eaten like an apple or sliced and added to salads, salsas or sandwiches. They are edible before fully ripe, and are sweet with a crisp texture. They should not be confused with the Hachiya persimmon, which has an astringent quality that makes the mouth pucker if eaten before full ripeness develops. One raw, medium-sized Fuyu persimmon contains 118 calories, according to the U.S. Department of Agriculture Nutrient Database. One Fuyu persimmon has 6 grams of dietary fiber, 270 milligrams of potassium, 2,733 International Units of vitamin A and 31 grams of carbohydrates, notes the USDA. A good Fuyu persimmon is heavy compared to its size, has unblemished skin and ranges in color from a pale, yellow-orange to deep reddish-orange. Persimmons with a darker color are usually sweeter. The fruit will gradually soften when left at room temperature.